It seems a long time ago now that Gordon Hayward left Utah and the Jazz for Boston and the Celtics. There was some odd stuff that happened leading up to that double-clutched decision, and some things that did not happen that should have. A timely phone call, for instance, to Jazz owner Gail Miller would have been proper. But the improprieties have faded over the past year and a half, since those events took a turn for the worse, along with Hayward’s ankle. That’s not a cheap shot. 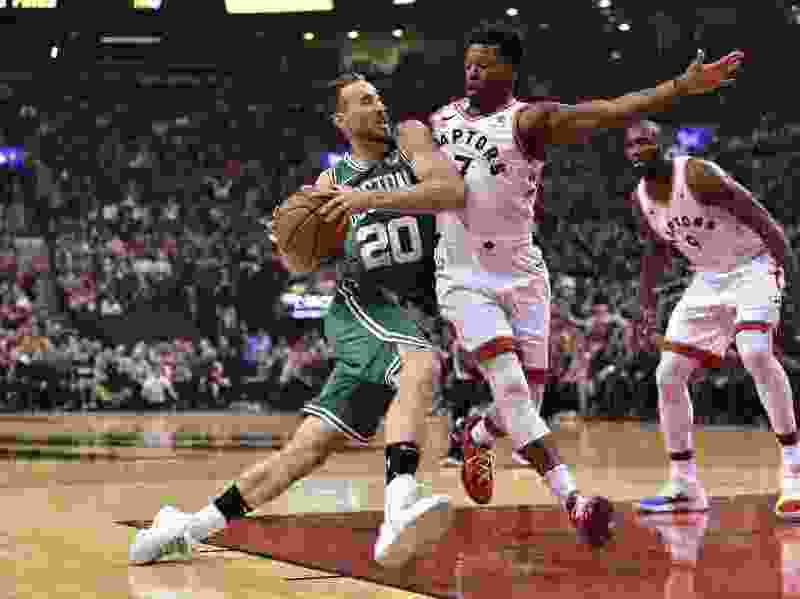 It’s a fact that when Hayward suffered that difficult injury in the first few minutes of his first Celtics game, rancor around here toward the man who jumped ship changed to sympathy. Not all of it, but some, anyway. Sports loyalty among fans in Utah is a powerful thing. Tucked between the mountains here, they pour their hearts and souls, so much passion — and a good bit of money for tickets and jerseys and other assorted gear — into supporting the players on their team, so much so that when those players don’t feel the same about them, when those players walk away, fans react as though they’ve been betrayed. Nobody likes betrayal, even if one understands at least at some level the realities of free agency in modern sports. But devoted fans, the ones who pour in all of that emotional investment, don’t have that same option. They don’t just wake up one morning, after years of investing, and decide they’re moving their loyalty to, say, the Golden State Warriors. Well … unless they’re Lakers fans. That’s the kind of attachment the NBA and other leagues count on to cause fans to commit to all the aforementioned, to pay a lot of money for tickets, parking, arena food, T-shirts and jerseys, as they connect to these teams and players, watching them perform, screaming their guts out for them to succeed. It’s unlike any other company-customer relationship, with the possible exception of Apple’s iSheep. That’s the way it is with most sports fanbases. People identify with their team, and their team becomes part of their identity. If the team wins, they win. If the team is a winner, they are winners. And if it loses … nobody wants to be a loser. 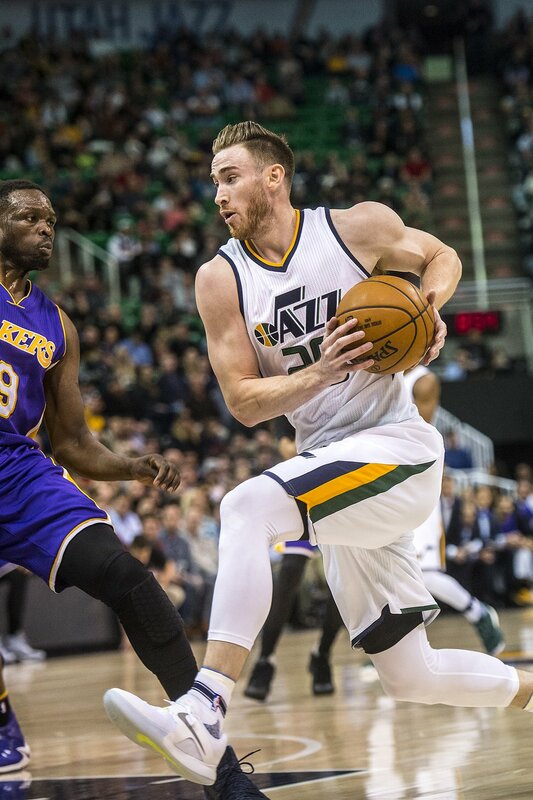 Chris Detrick | The Salt Lake Tribune Utah Jazz forward Gordon Hayward (20) runs past Los Angeles Lakers forward Luol Deng (9) during the game at Vivint Smart Home Arena Thursday January 26, 2017. So, Gordon Hayward was drafted by the Jazz back in 2010, and many weren’t quite sure initially what to make of that ninth overall pick. Fans here saw him play in the NCAA Tournament with Butler in the same venue in which he later suited up for the Jazz. They were aware of him, they just didn’t know if he could really ball, whether he could make a difference. It took him a while, and through coaching changes and a front-office move and the matching of an offer from the Charlotte Hornets, and, thereafter, a whole lot of resources devoted to his development on the part of the team, as well as a mix of his own effort, he became an All-Star. Ask Johnnie Bryant how much time he spent working with Hayward — on his shot, on his handle, on his movement, on his game. Ask Quin Snyder, who pretty much turned his emerging team over to Hayward. And when the time came, Hayward bolted, taking his four years and $128 million, even as and after his teammates, coaches, management, team owner went to San Diego to offer him a maximum amount of money and more opportunity to be the main man, to reel him back in to the place where he became a star. It wasn’t even so much that he decided to leave. It was the way he left. He waited, he fumbled around, stringing everyone along, as the club missed out on chances to sign other players, and then his goodbye/hello epistle was published, apparently so quickly written, or not, in The Players’ Tribune. And like that, it was over. The entire process seemed disingenuous. Either way, Gordon was gone. Everybody here grumbled. And now, he’s back — for one night, Friday night, as the Celtics visit the Jazz, Hayward’s first time returning to Vivint Arena. It will be weird for him. Has to be. It will be weird for everyone on hand. But it’s all kind of distant now, clouded. The growing success Utah had last season — while Hayward got hurt, healed and rehabbed — washed out much of the bitterness, the memories of billboards and thousands of letters begging him to stay now forgotten. Donovan Mitchell’s rise did much of the rinsing and erasing. Maybe. Maybe not. No need to worry about that for another six years. Hayward will get booed, that’s a given. How loudly and thoroughly, though, nobody knows. He’s a Celtic now, not so much a former Jazzman. A couple of months before he announced he was heading to Boston, Hayward was straight-up asked if he wanted to stay in Utah, if he would remain with the Jazz. He listed off all the great things that had happened to him here. He grew up as a man and as a pro here. He started a family here. He came to appreciate the fans here. He became an All-Star here. After winning just 25 games in an early season here, he went on to make the playoffs and win a playoff series here. He said he enjoyed it here, even as he refused to commit to continue playing here. Even as Jazz fans loved him back, Hayward never said he wouldn’t love Celtics fans more. He never said he wouldn’t be happier in Boston. And so, Jazz fans will greet him now as though he does exactly that, as though he left their love hanging, which he did. Still, the thin line in this case isn’t so much between love and hate. It’s between the combination of love given/love taken and love aimed elsewhere. But as the months have gone by, 16 of them now, those fans have redirected their emotion, their adoration, too, toward Mitchell and Rudy Gobert. It’s like romping around with Kate Beckinsale or George Clooney for seven years, then having one or the other reject your love, scorning you, and then having Margot Robbie or Brad Pitt step in to love you better. Mitchell is their guy. Hayward, they figure, can take a flying leap. But they don’t hate the man who turned away from them, as much as they love their own who haven’t.